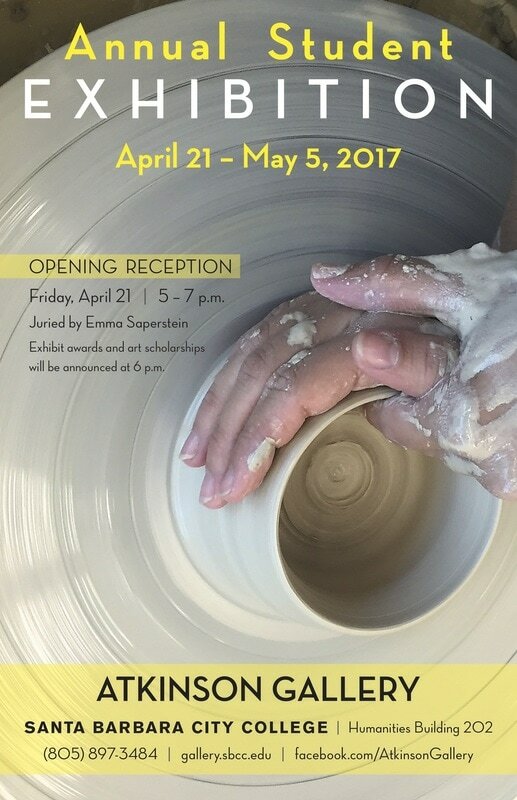 Santa Barbara, CA - The Atkinson Gallery at Santa Barbara City College is pleased to present the Annual Student Exhibition featuring new works by students in the Art Department. The exhibit opens at 5pm on Friday, April 21 with a reception for the artists, including Alexandrea Altamirano, Anthony Benedict-Smith & Kathryn Lubahn, Nancy Bingham, Joanna Bourain, Sarafina Brown, Patrick Cole, Hannah Croshaw, Adam Cumberbatch, Yanley Delgado, Brittany Eggert, Olivia Friedman, Austin, Gillison, Haylee Heller, Jia Chun Lily Jones, Megan Kagiyama, Nicole Landis, Alberto Lule, Melissa Mathieson, Harumi McWhorter, Mei Miyasaka, Emily Morrill, Lauren Nishioku, Adriana Olvera, Lorien Rennie, Angelica Rose, Lisa Saal, Lindsay Summer, Alessandra Villegas, Melanie von der Schulenburg, and Chelsea Willett. Art Department Scholarships and Exhibition Awards will be announced during the reception at 6pm. The exhibit continues through Friday, May 5, 2017. This year, Emma Saperstein, director of the Harold J. Miossi Art Gallery at Cuesta College, juried the competitive exhibit which showcases work in all levels and in all media including drawing, painting, printmaking, ceramics, sculpture and time-based media. Saperstein is a performance artist, curator and arts administrator based in San Luis Obispo, CA. In addition to her work at Cuesta College, Saperstein also works as an Associate with the collective, Shared_Studios. A graduate of Wheaton College and the New York Center for Art and Media Studies, her experience includes serving as studio manager to internationally recognized artist Titus Kaphar, co-curator of Inverse Performance Art Festival, involvement in the thriving alternative arts and publishing community in Chicago, specifically with the Public Media Institute, Lumpen Magazine and the Co-Prosperity Sphere. For the past two years, she has served as an editor and curator for the feminist collective HYSTERIA.